I designed and devel­oped the KevinABarnes.com per­son­al web­site, as well as research, write and man­age all of the site’s con­tent, includ­ing fea­ture arti­cles on top­ics such as astron­o­my, sci­ence and tech­nol­o­gy. Although the web­site orig­i­nal­ly was hand cod­ed in HTML, in May 2007 I migrat­ed it to the WordPress CMS plat­form. 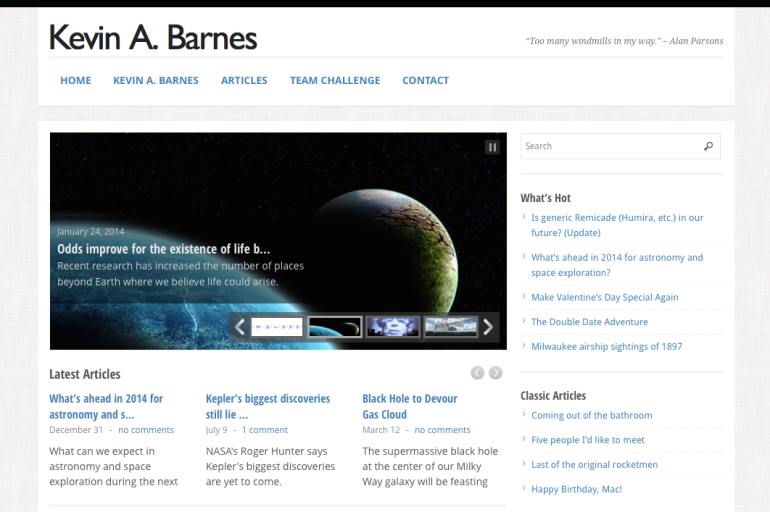 KevinABarnes.com cur­rent­ly employs a cus­tom WordPress theme cre­at­ed by Kevin exclu­sive­ly for that web­site. This sample originally was published to portfolio.kevinabarnes.com on June 4, 2014.